It’s hard to imagine the music director of the Grammy Award- winning, all-male vocal ensemble Chanticleer failing an audition. But when Matthew Oltman, who sang tenor with Chanticleer for 10 years before becoming the group’s artistic leader, tried out for a spot as a tenor in Iowa’s All-State Chorus at the age of 14, he didn’t make the cut. It used to be that as soon as boys’ voices began to break, their opportunities for group singing suddenly dried up. With children’s choirs only catering to pre-pubescent voices, and high school glee clubs and youth choirs seeking full-throated male tenors and basses, boys going through the period of vocal transition entered a choral “blind-spot.” Their choices essentially amounted to being forced by their instructors (or forcing them- selves, like the young Oltman) to sing in a grown-up register before their time, or, more commonly, stopping singing altogether. Lacking encouragement not only from choral institutions but also from their communities, adolescent boys have been quick to turn their backs on singing. “They’re torn because many parents and peers would prefer that they played sports,” said Francisco Núñez, artistic director and founder of the Young People’s Chorus of New York City. 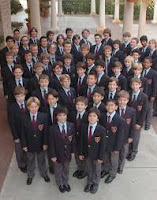 Of the nearly 500 choral teachers surveyed in a 2007 research study conducted by the National Association for Music Education (MENC), 69 percent replied that they had seen a drop in boys’ participation in chorus in grades six to nine and 50 percent blamed the fall in attendance on the boys’ embarrassment about the change in their voices. In recent years, ensembles dedicated to nurturing boys through this major upheaval in their musical lives have started to spring up all over the country in cities as diverse as New York, Los Angeles, Charlotte (NC), and Minneapolis/St. Paul. These young men’s groups are singing a wide-ranging repertoire, from Thomas Tallis motets to covers of songs by the indie rock group Radiohead. And far from treating the devel- oping singers like cocooned larvae, many choral directors are putting their young men’s choruses under the spotlight to great acclaim. This July, the Graduate Chorale of the San Francisco Boys Chorus, an ensemble of around thirty 14-to-18-year-olds that rehearses once a week and was founded in 2002, will sing in the Glinka Capella in St. Petersburg, Russia. The 50-member Young Men’s Division of the Young People’s Chorus of New York City recently sang with James Taylor at a gala at Carnegie Hall and earned standing ovations for their 2009 and 2010 appearances in Switzerland and Japan. A proliferation of workshops, conferences, and festivals catering to the changing male voice are further helping to foster knowledge about and enthusiasm for choral activities for teenage boys. The Providence Singers of Rhode Island and the Handel and Haydn Society run annual Young Men’s Choral Festivals. Next February in Dallas, the Cambiata Institute of America (a University of North Texas-based early adolescent vocal music research organization) and the American Choral Directors Association will co-host the first national conference designed specifically for middle school and junior high school choristers. Meanwhile, the Charlotte Children’s Choir’s yearly Boys to Men Choral Workshop encourages boys in grades 8 through 12 to participate in musical activities. “Current male members of the choir serve as mentors to the boys who participate in the workshop, which focuses on developing performance techniques and allows the boys to learn songs in a non-threatening, all-male environment,” said Nancina Pope, executive director of the Charlotte Children’s Choir. The American choral world’s increased attention on adolescent boys is clearly starting to pay off. Retention rates are quite high. Since Stillitano launched his Young Men’s Chorus in 2006, the group has lost only five students other than graduating seniors. As many as 45 percent of participants have stayed with the ensemble for at least three years or joined the group after participating in one of Handel and Haydn Society’s junior choruses. “Most of our Graduate Chorale members stay for four years, and others, having decided to leave before the four years are up, miss it so much that they come back to continue,” said Claire Quinn-Duggan, program manager of the San Francisco Boys Chorus. Repertoire must also be specially tailored to suit these voices. Directors like Fox use a combination of pre-existing arrangements of songs for boychoirs and often transpose pieces themselves to suit the singers’ shifting ranges. Although a few music publishing companies like the Arkansas-based Cambiata Press distribute works transcribed for voices in transition, there isn’t yet a tradition of composers writing specifically for choruses comprised of adolescent boys. But the growing wave of interest surrounding this area of choral activity—more children’s choruses, such as the Vivace Youth Chorus in San Jose and the Silicon Valley Boychoir either recently launched or are exploring the idea of launching their own teen boy ensembles—suggests that it might not be too long before there’s an entire canon of original works devoted to boys with changing voices.